The doctrine of the Holy Eucharist consists of that of the Eucharist sacrifice, the sacrificial meal, and the sacrificial food, or to express it otherwise, it consists of the doctrine of the Mass, of Communion, and of the Real Presence. There is no presence of Christ in the Blessed Sacrament that is not meant first and foremost as food for the faithful people and there is no sacramental union with Christ in Holy Communion that is not to be thought of as a sacrificial meal: “For as often as you shall eat this bread, and drink the chalice, you shall show the death of the Lord, until he come” (1 Cor. 11:26). The Eucharistic meal can only be prepared in the sacrifice of the Mass. Thus the mystery of the Eucharist summarises the whole mystery of our redemption. There are two fundamental relationships in which Christ stands to us. First, he is our priestly mediator with God, and offers him atonement for our sins. But Christ is not a stranger to us, who merely represents us as a propitiator before God. He comes to us in the second relationship by being the mediator of the grace which God gives us on account of his sacrifice. That is the mystery of our union with Christ who is the source of all grace for us. “And of his fullness we have all received, grace for grace” (John 1:16). This second community is realized only in the sacrifice of the Cross, by his giving his life for his Church which he had to ransom from himself. Only in death did Christ seal the deep covenant with the Church whereby she is purified and sanctified and which according to the teaching of St. Paul is the image of the most intimate union of human being in marriage: “Husbands, love your wives, as Christ also loved the Church and delivered himself up for it; that he might sanctify it, cleansing it by the laver of water in the word of life” (Eph. 5:25). From the opened side of our crucified Saviour the Church was first born, as Eve was taken from Adam's side. That is the most ancient way of expressing this truth. 1. Doctrine about the Eucharistic sacrifice. Holy Mass is a real sacrifice, instituted by Christ at the Last Supper. It represents Christ's sacrifice of the Cross, but in an un-bloody manner. Priest and victim are both Christ, who offers himself through the priest. The laity also offers the sacrifice, but does not have the power to transubstantiate. The Eucharistic sacrifice is offered to God in praise, thanksgiving, petition and atonement, for the living and the dead. Saints may also be commemorated in honour and petition. The Church has the responsibility of determining the rites and prayers to be observed. The liturgy as a whole is the public worship by the mystical Body of Christ. In every liturgical activity Christ is present, in a manner that must be properly interpreted. The Holy Eucharist is a true sacrament, instituted by Christ. Christ is really present in the Holy Eucharist, even when not being received. It is therefore to be honoured and adored. The whole Christ is present in either kind and is received by the communicant. 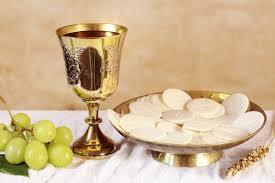 For the wheat bread and grape wine are transubstantiated by the ordained priest into the flesh and blood of Christ so that only the appearance of bread and wine remains.